Use a pair of sharp scissors to cut the Fruit Roll-Ups™ into 1 1/2-inch triangles. The triangles should be tall, long, and skinny. They're going to become the husks of your corn, so you'll want to unroll them (leaving the plastic on one side of the Fruit Roll-Ups™) and slice them into leaf-like pieces. They don't have to be perfect! In a large, nonstick skillet, melt the butter and add the marshmallows. Stir over medium heat until melted. Add the Kix™ cereal. Allow to cool just slightly. Wet your fingers with just a bit of cold water. Working quickly, press together a golf-ball sized amount of KIX™ together, the roll them into cob-shaped ovals. Remove the plastic from the backs of two of your pieces of Fruit Roll-Up™, gentle press the triangles on to the bottom sides of the corn cob. Continue until all corn cobs have been assembled. Serve and enjoy! Fun appetizer ideas for kiddies that'll make the grown ups wanna sit at the kids table! Hey, appetizers aren't just for adults! Let the kids in on the action with snacks and giggles made with them in mind. Here are fun and easy apps that'll ward off the hunger pangs with fun foods made just for the li'l folks. 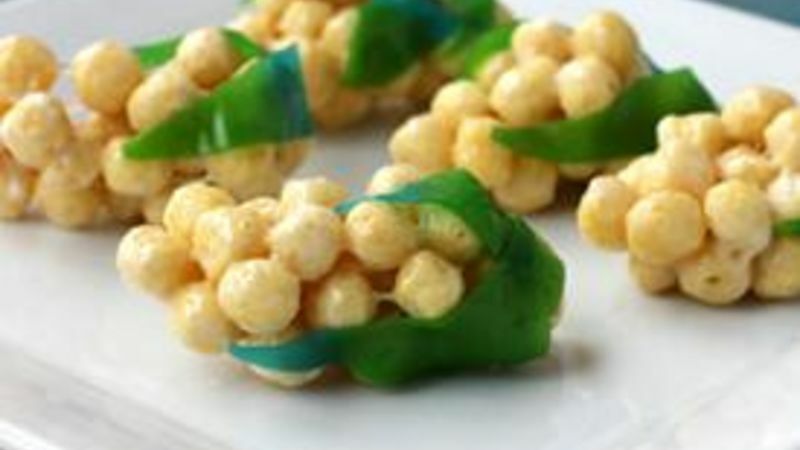 Turn a box of Kix cereal and Fruit-Roll Ups into these ridiculously easy and totally adorable one-bite corn-on-the-cob treats. Here are more easy treats the kids will love!